"On hypersonics, this is a good example of an area of technology that is going to move forward whether we invest in it or not," Kendall told a hearing on the United States shift toward Asia. "China is doing work in this area." "The high speed of these systems makes it much more difficult for air defenses to engage," he said. Kendall, in testimony on the Obama administration’s so-called "pivot" to Asia, said the Chinese development of hypersonic strike weapons is an area of technology that is likely to outpace U.S. efforts in the future. "When I spoke earlier about feeling reasonably comfortable where we are today [with arms technology] but not necessarily so comfortable five or 10 years from not, this is one of the technologies that would be on that list of things that in five or 10 years we might have a much bigger problem with then," Kendall said. The comments followed questioning from Rep. Trent Franks (R., Ariz.), who said he shares the concerns about the Chinese hypersonic glide vehicle development and testing. "My purpose here is to try to elevate that concern because I think it is a significant one, especially since given time, it will manifest," Franks said. Adm. Samuel Locklear, commander of the U.S. Pacific Command, noted that the hypersonic test demonstrated China’s ability to move quicker than the United States in developing some advanced arms. "The Chinese, as other nations are, are pursuing hypersonic technologies," Locklear said last week at the Pentagon. "This is just one of many, you know, highly technical militarized systems that whether the Chinese are developing them, or we’re developing them, or Europeans are developing, that will continue to complicate the security environment with high-technology systems." "We will have to figure them into the calculation of how we’re going to maintain a peaceful security environment in the future," he added. Committee Chairman Rep. Buck McKeon (R., Calif.), along with subcommittee chairmen Reps. Randy Forbes (R., Va.) and Mike Rogers (R., Mich.), described the hypersonic test in a statement as the Chinese military "leaping ahead of us" in arms development. "The Asia Pacific is fast becoming a powder keg," the lawmakers said. "Allowing nations that do not share our respect for free and open avenues of commerce to gain a strategic advantage over the United States and her allies only brings us closer to lighting the fuse." Vice Adm. Frank Pandolfe, director of strategic plans and policy for the Joint Staff, said during the hearing that he would only discuss the Chinese hypersonic test in a closed-door hearing. Earlier, Kendall said the Pentagon is facing numerous challenges to the U.S. military’s technological superiority, including in Asia, as part of a new policy designed to prevent China and other nations from blocking U.S. access to the region. "Anti-access/area denial capabilities that concern us cover a range of conventional capabilities," Kendall said. "In the case of China in particular, for example, they include space control investments; offensive cyber capabilities; conventional ballistic and cruise missiles with precision seekers designed to attack both fixed land installations and surface ships, including aircraft carriers; air-to-air capabilities, including fifth-generation fighters; long-range missiles with advanced technology seekers; and electronic warfare systems." China is expected to field a new fight-generation jet fighter, the J-20, in the next few years and also could export the aircraft to other states, he said. At the same time, the U.S. military is being cut sharply, undermining both high-technology weapons development. "China's pursuing a long-term comprehensive military modernization program focused on anti-access/area denial capabilities," Kendall said. "Today our investments, on the other hand, are being limited by budget cuts that fall disproportionately on modernization, research and development and procurement." The Obama administration has cut more than $500 billion dollars from defense spending in the past several years. "The size of the immediate reductions we are experiencing is bad enough," Kendall said. "Uncertainty about future budget reductions make sizing our force problematic and encourages a slower drawdown in our force structure. This in turn causes even larger reductions in modernization." Kendall said that until military forces are reduced to sustainable levels, "we will be forced to disproportionately reduce modernization, the very investments that provide with technological superiority in the Asia-Pacific region and elsewhere." Last year, the Pentagon spent around $65 million on hypersonic weapons research and development in its Prompt Global Strike program. The figure included a cut of $66 million from earlier proposed spending. Another $45 million was allocated to the Defense Advanced Research Projects Agency for hypersonic work. 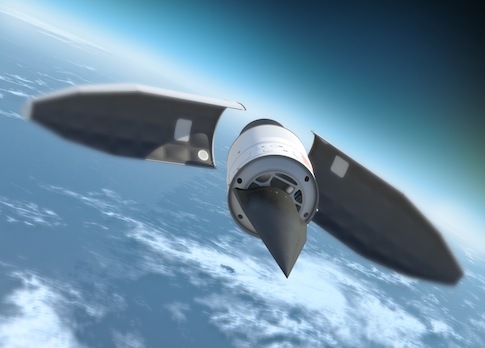 Officials said the Lockheed Martin hypersonic glide vehicle demonstrator, known as HTV-2, is being shelved after two tests. The HTV-2 is designed to travel at Mach 20 or 15,224 miles per hour. Boeing is developing a X-51 Waverider, a scramjet powered high-speed vehicle. The Army is also developing an advanced hypersonic weapon that could be used high-speed missile defenses. A congressional aide said U.S. development of hypersonic weapons is required under U.S. strategic nuclear reviews and guidance but the administration has failed to adequately pursue the weapons. If the forthcoming defense budget request, scheduled for release March 4, adds funds for hypersonics, it would be a sign of renewed commitment following the Chinese test, the aide said. "We’ve been pushing them and trying to get them to do more. But it’s not clear whether we’re pushing against an open door or closed door," he said. Kendall declined to comment on the administration’s fiscal 2015 request. But other defense officials said funding for hypersonic weapons could be increased for fiscal 2015 in the aftermath of the Chinese test. Kendall said he is "very comfortable" with U.S. weapons capabilities today. "I'm not sure we will say that in five or 10 years down the road," he said. "And the trajectory for our relationship with China is uncertain today, where we're going to go in the future, one of the reasons we're focused on the Asia Pacific is we want to do our best to influence that trajectory to go in a positive way." He said there is a range of weapons and technologies that need greater investment "than we may be able to afford with the current levels." McKeon said at the hearing that he is concerned that plans to refocus on Asia from wars in the Middle East and South Asia may contribute to global insecurity. "When the president framed rebalance, he discussed how we could now safely turn our attention to Asia because the war in Afghanistan was receding, and al Qaeda was on the path to defeat," McKeon said. "I'm concerned these commissions haven't panned out. Violence and instability rage in the Middle East and Africa. Preserving forces' readiness and capabilities in [Pacific Command] means less elsewhere. Can we afford to take risk in [Central Command] or [Africa Command]?" McKeon questioned the validity of the shift to Asia and noted that the budget for the U.S. Pacific Command is being cut. Defense budget cuts have made the problem worse, he said. The recent passage of the omnibus spending bill provided some stability for the next two years, but after that the same problems will reemerge. "And military leaders are left with no choice but to cut end strength, readiness and capabilities," he said of the future. "And that has consequences for our security and military commitments in Pacom and across the globe, unless we adequately resource defense." This entry was posted in National Security and tagged Buck McKeon, China. Bookmark the permalink.